I don’t normally read books like this, but the Trump phenomenon over the last several years is so seismic (or yuge) and because the book was on sale, I felt that I had to give it a shot. I’d heard some of the complaints by Trump about “Little Katy” during the campaign but didn’t understand what was going on. I don’t watch the news on cable or TV and had almost no experience with who this reporter was or her role in covering the Trump campaign. I almost stopped reading during the first couple chapters. Tur came across exactly how I had worried she might – argumentative, vulgar at times, and – most importantly – clearly biased. I had no interest in reading a book by someone with an axe to grind. But I was listening to this book – thanks Audible! – while playing Elder Scrolls Online so I left it playing while I became the Scarlet Judge. After a couple hours at 155% speed I was about half way through the book and had overcome my concerns. Oh, Tur is definitely biased and she I believe she definitely has an attitude (she narrates and I believe it’s clear in her tone). But she is also really interesting. 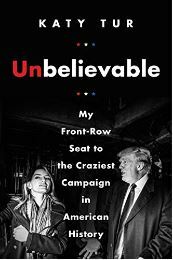 I’m not sure I’ll read other books by Tur in the future – or other books about Trump or his campaign – but as a one-time, sale-induced read it wasn’t bad.